The bile is a sticky fluid produced in the liver, stored in the gallbladder and delivered into the intestine, where it aids in the digestion of fat. The bile in the gallbladder is yellow-green or brown due to bile pigments bilirubin and biliverdin . The normal intestinal bacteria convert bilirubin into urobilinogen, which colors the intestinal contents (chyme) yellow, and finally into stercobilin, which colors the stool brown. During diarrhea, the stool can appear yellow or green, because the bile passes through the intestine fast and the bacteria do not have enough time to change its original color to brown. The bile in the vomit appears green or yellow and has a bitter taste [7,13]. Bile acids are produced from cholesterol in the liver cells. After the connection with the amino acids taurine or glycine they are called conjugated bile acids, and after further connection with sodium and potassium, they become bile salts . The bile physically breaks down big particles of dietary fats into small droplets and thus makes them more digestible; this is known as fat emulsification . Next, the enzyme lipase from the pancreatic juice chemically breaks down fat molecules (triglycerides) into fatty acids and monoglycerides, which can then pass from the intestine into the blood; this is known as fat digestion and absorption . NOTE: The bile does not contain digestive enzymes and it does not digest fats; it only emulsifies them. The bile also assists the absorption of cholesterol and fat-soluble vitamins A, D, E and K .
The bile is alkaline (pH = 7-8), so it helps to neutralize the stomach acid that is delivered to the small intestine with food [3,4]. Immunoglobulin A in the bile can fight microbes and thus protect the intestine against infections . The bile is produced in the liver cells and secreted into the small channels between them (the bile canaliculi). The bile flows out of the liver via the common hepatic duct  (Picture 1). In adults, the liver produces 500-1,000 mL of the bile per day [3,4,5]. The following foods and herbs may stimulate the bile production in the liver but there is INSUFFICIENT EVIDENCE about the related health benefits: bitter artichoke , celery, dandelion root , gentian and wormwood , ginger , turmeric (curcumin) , fennel, green tea, horseradish, limes, Spanish black radish, whole grains and walnuts . NOTE: The bile production in the liver can be reduced due to a severe liver disease or genetic disorder. Between the meals, a muscular valve (the sphincter of Oddi) at the end of the common bile duct contracts and increases the pressure in the common bile duct, which forces the bile from the common hepatic duct to flow via the cystic duct into the gallbladder (Picture 1). 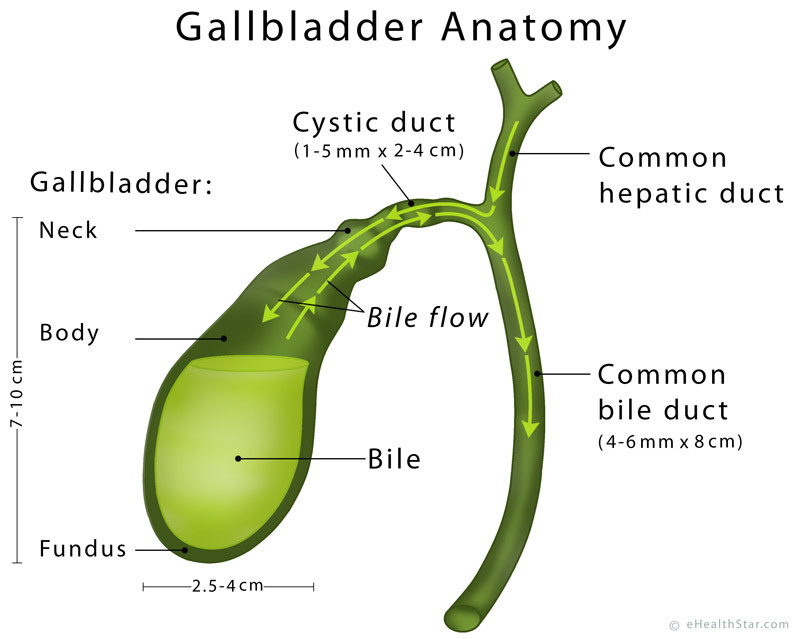 In the gallbladder, the bile is temporarily stored and concentrated . The gallbladder usually contains about 30-50 mL of bile . After meals, the gallbladder contracts and the sphincter of Oddi relaxes, which allows the flow of the bile from the gallbladder through the cystic and common bile duct into the duodenum (Picture 1). A gallstone or cancer in the common bile duct can obstruct the flow of the bile, which then backs up into the blood, skin and urine resulting in jaundice and dark yellow urine. At the same time, the absence of the bile in the small intestine results in the malabsorption of fats and their appearance in the stool, which appears grey and greasy (steatorrhea). Very low calorie diet (<800 Cal/day) can result in poor bile flow and consequently in thick bile (gallbladder sludge) or gallstones. Gallbladder removal or a disorder of the valve at the end of the stomach can result in the backflow of the bile from the duodenum into the stomach (bile reflux). About 95% of the bile salts that flow via the bile into the first part of the small intestine (the duodenum) is reabsorbed in the last part of the small intestine (the ileum), taken up by the liver and secreted in the bile again . This is known as enterohepatic circulation (enteron = intestine, hepar = liver). Similarly, about 50% of the cholesterol secreted via the bile is reabsorbed . Certain drugs, vitamins and minerals secreted in the bile can also be partially or completely reabsorbed. NOTE: In a disease of the last part of the small intestine or after gallbladder removal, the bile may not be sufficiently reabsorbed and may trigger diarrhea.